As documented in a farmdoc daily post last week, ethanol producers over the last year have enjoyed one of their best periods of profitability ever. This has been driven by a drop in corn prices that substantially exceeded the declines in ethanol and DDGS prices. This has put the ethanol production industry on a much sounder financial footing after being ravaged by drought-related losses in 2012. Today’s post on biodiesel production profits is the second in a two-part series that examines recent trends in biofuel production profits. This model is meant to be representative of an “average” plant constructed since 2006 to process soybean oil into biodiesel. There is certainly substantial variation in capacity, production efficiency, and feedstock across the industry and this should be kept in mind when viewing profit estimates from the model. However, limiting the feedstock to soybean oil is reasonable since it represents over 50 percent of all feedstock used to produce biodiesel in the U.S. and feedstock prices tend to be highly correlated (see Figure 5 in this earlier farmdoc daily post). To track plant profitability over time, weekly biodiesel and soybean oil prices at Iowa plants from the Agricultural Marketing Service (AMS) were collected starting in 2007. Natural gas costs are estimated based on monthly data from the Energy Information Agency (EIA). Glycerin and methanol prices were obtained from OPIS. Figure 1 presents the (pre-tax) estimates of biodiesel profits based on the prices and model assumptions. There have been basically three sub-periods in terms of positive profits, with losses generally occurring outside of these periods: i) March – December 2008, ii) March – December 2011, and iii) March – December 2013. The difference in returns during the profitable and unprofitable periods is striking. When returns are in the black the average is $0.35 per gallon compared to -$0.16 per gallon when returns are in the red. The two largest spikes in profitability can be traced to the effects of biofuels policies. The first major spike in 2011 was directly attributable to the race by diesel blenders to take advantage of the blender tax credit that was set to expire at the end of 2011. The second major spike in 2013 was also directly attributable to the race by diesel blenders to take advantage of the blender tax credit that was set to expire at the end of 2013 (the credit has yet to be reinstated for 2014). In addition, obligated parties under the RFS needed to incentivize expanded biodiesel production in order to meet the increased biodiesel mandate for 2013 and build up the stock of biodiesel RINs that could be used to fill the “renewable gap” in future years (see the post here). Additional insight into the impact of biofuels policies on biodiesel profits is provided by Figure 2. Here, the biodiesel price at Iowa plants is plotted versus a simplified breakeven profit relationship between soybean oil and biodiesel prices. Since soybean oil represents over 80 percent of the variable operating costs of the representative plant, all other costs are lumped into the constant term of 0.60, or 60 cents per gallon of biodiesel produced. The 7.55 slope is just the number of pounds of soybean oil required to produce a gallon of biodiesel. One can readily observe that the line for the breakeven relationship tracks the biodiesel price very closely except for the two major spikes discussed above. In other words, outside of the two spikes, the market has generally priced biodiesel based on the cost of soybean oil, a markup for other variable and fixed costs, and zero profits. 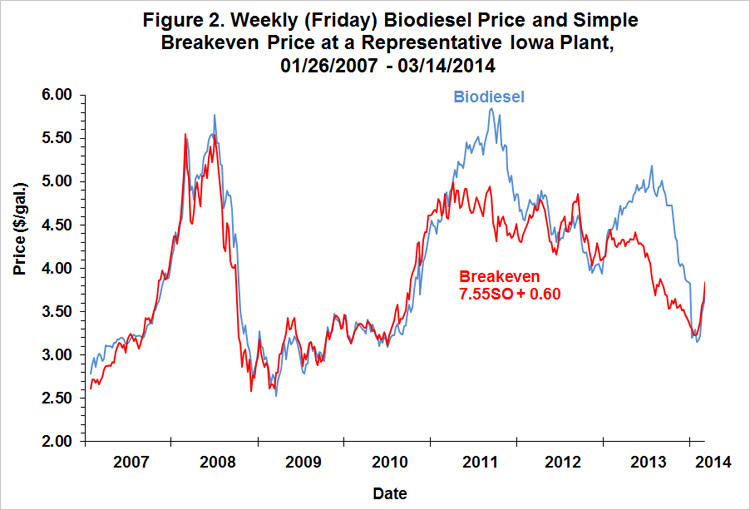 This also implies that, outside of the two spikes, biodiesel and soybean oil prices track one another very closely. In contrast, biodiesel prices were pushed up substantially above breakeven levels within the two spikes as diesel blenders raced to take advantage of the blenders tax credit before it expired and engaged in discretionary blending to build stocks of biodiesel RINs. In terms of the latter point, we have argued in several previous posts (for example, here) that the pressure of meeting the RFS renewable (ethanol) mandate with a binding and steep E10 blend wall ultimately shows up in the price of biodiesel. Finally, it is helpful to aggregate the profit margins over an annual horizon in order to see broader trends in estimated biodiesel production profits. Figure 3 shows total annual (pre-tax) profits net of variable and fixed costs for each calendar year between 2007 and 2013. Profits are presented in terms of both total dollar returns to equity holders and percent return to equity. The magnitude of profits during the two “spike” years of 2011 and 2013 is particularly striking. Annual profits were $12.8 million and $15.4 million in 2011 and 2013, respectively. The 2013 profit was easily the highest over the seven years. The percentage returns in 2011 and 2013, 54.4 and 64.3 percent, respectively, are truly eye-popping. Outside of the spectacularly profitable years of 2011 and 2013, cumulative returns were actually negative (-$3.8 million). Despite the skewed nature of profits, returns to equity holders over 2007-2013 actually averaged a quite respectable 14.7 percent. This is more than twice the average return to equity holders in ethanol plants, estimated in last week’s post to be 5.8 percent. 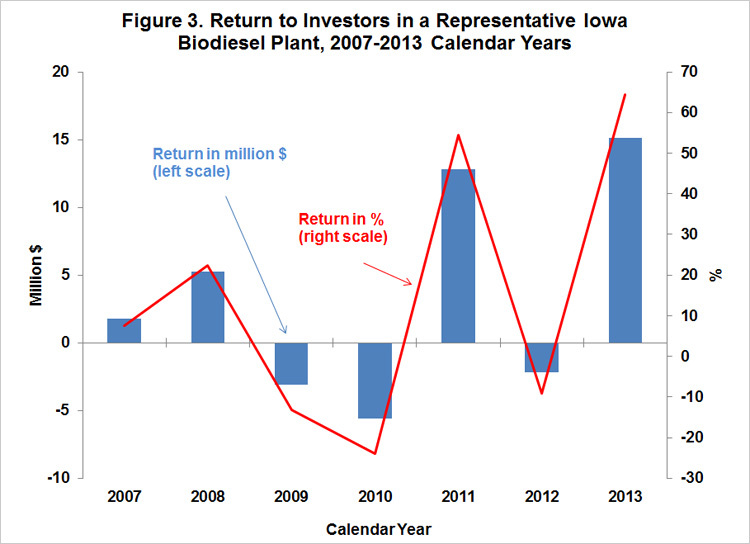 The picture that emerges from this analysis of biodiesel profits is one of feast or famine. 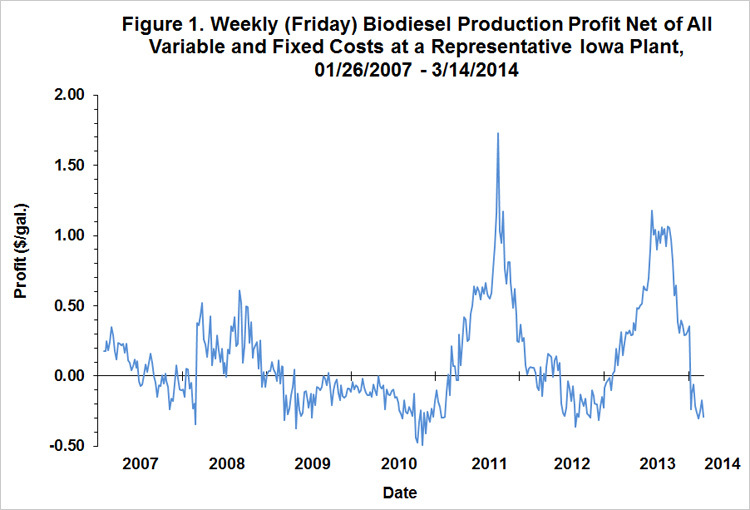 If conditions are right, as they were in 2011 and 2013, biodiesel production profits can spike to spectacular levels. Outside of these conditions, however, it is difficult for the biodiesel industry to stay out of the loss column. This highlights the central role that policy incentives, mainly from the biodiesel blenders tax credit and RFS mandates, play in driving the profitability of the biodiesel production industry. Are There Acres Missing from the USDA’s Prospective Plantings Report?